A South African Enclave, Lesotho is just one of those countries that make geography a more interesting subject. Brief through this article and find out why. A country within a country, Lesotho is definitely worth reading about. Wholly landlocked by the country South Africa, Lesotho has a bundle of unique features and is known to be the only country entirely above an altitude of 1,400 metres. With an approximate population of 1,919,552 (as of July 2010), Lesotho is mainly composed of highlands accounting for its cold weather. Formerly known as Basutoland, this mountainous country emerged as a single polity under King Moshoeshoe I in 1822. Constant battles pervaded the territory as ‘boer trekkers’ from Cape Colony invaded and claimed land rights. Moshoeshoe fought a series of wars and lost a huge chunk of the lowlands. This gave him impetus to appeal to Queen Victoria, who readily declared Basutoland a British protectorate in 1868. In 1884, Basutoland was restored its status as a crown colony, albeit under direct rule by a governor. In 1966, Basutoland gained independence from the United Kingdom and was then renamed as the 'Kingdom of Lesotho'. Delve deeper into the intriguing characteristics of this landlocked nation as you come across various interesting facts. It is the only independent state in the world that lies entirely above 4,593 feet in elevation. Lesotho has the highest lowest point (4593 ft) in the world. Villages of Lesotho can only be reached by riding horses, trekking or by flying light aircrafts. Over 80% of the country is 1,800 metres above sea level. Lesotho underwent seven years of military rule after which its constitutional government was restored. 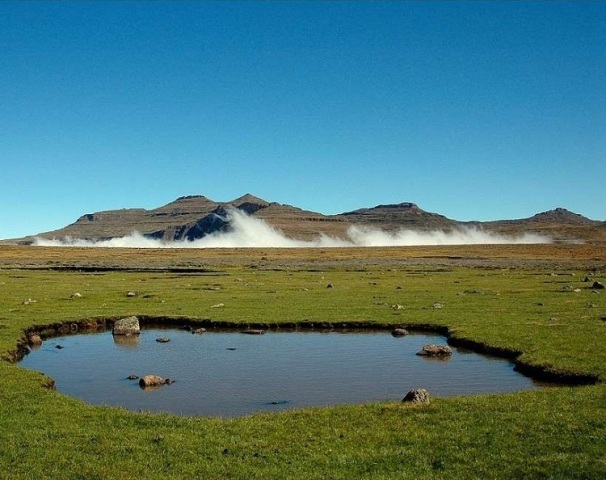 Lesotho is made up of 30,355 sq km of land, and has no major water body. Citizens aged 15 and above can read and write. Lesotho exports wool, mohair, clothing, and footwear with one of Levi's jeans manufacturing facilities located right there. Lesotho relies heavily on funds obtained by miners employed in South Africa and customs duties from the ‘Southern Africa Customs Union’ for the majority of government revenue. During the winters, shepherds trudge along snowy fields with only boots and blankets, wrapped around their torsos. The economy of Lesotho is largely dependent upon its agriculture, especially its livestock. Unfortunately, drought has greatly hindered agricultural productivity. Yet, more than half of the country’s income is attained through agricultural sector. The official currency is the ‘Loti’ which can be interchangeably used with the South African Rand. Due to the global meltdown, economic growth within Lesotho drastically plummeted in 2009. The country’s budget relies intensely on custom receipts emanating from the Southern African Customs Union (SACU). The Lesotho government boasts of a constitutional monarchy. The Prime Minister, Pakalitha Bethuel Mosisili, is head of government since 29th May, 1998 as he led his party, the ‘Lesotho Congress for Democracy’ (LCD) into victory. Lowlands often touch 30 °C in summer and −7 °C in winter, while highlands hit −18°C during winter. Snow is common in the highlands between May and September and the summer thunderstorms are frequent in the lowlands. Diamonds are the icing on the cake as far as Lesotho’s trade and economy is concerned, and they are exported all over the world. Lesotho has one of the world's highest rates of HIV-Aids infection. Several campaigns for the locals to get tested have been encouraged. In January 1970, the ruling Basotho National Party (BNP) lost the first post-independence general elections to the Basutoland Congress Party (BCP), but was denied power by a military coup that supported the defeated prime minister Leabua Jonathan Molapo. Most of the locals resort to farming or mining (in South Africa) as a means of earning their daily living. A multi-billion-dollar Lesotho Highlands Water Project (LHWP) is designed to capture, store, and transfer water from the Orange River system to South Africa's Free State and greater Johannesburg area. This will be a phenomenal source of revenue for the country.